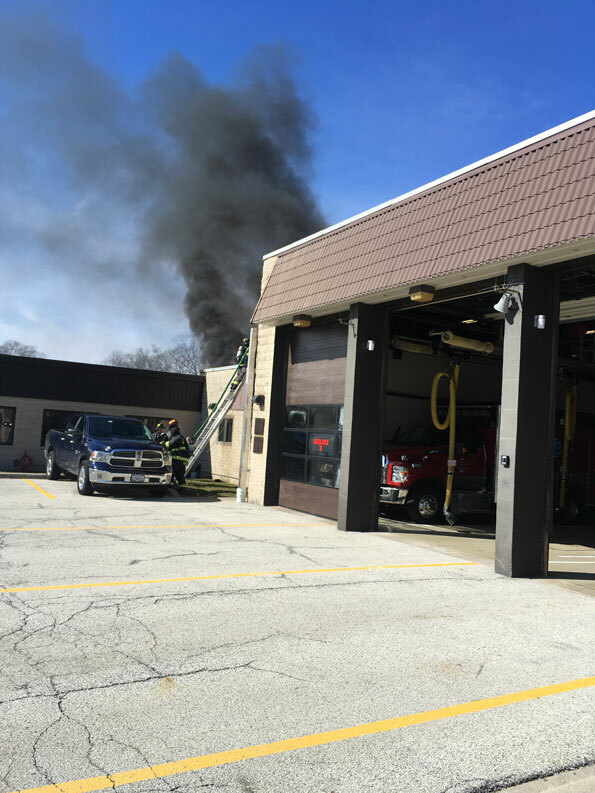 Rolling Meadows police and firefighter/paramedics responded about 12:52 PM Friday March 2, 2018 to a report of a roof fire at Rolling Meadows Fire Department Station 16, 2455 Plum Grove Road Rolling Meadows, Il. Professional roofers were repairing a hole in the roof over administrative offices at the fire station when the roof and possibly tar ignited. Firefighters reported a roof fire at their own fire station at Rolling Meadows Fire Department Station 16 after professional roofers notified the firefighters about the fire on the roof. Crews were already on the scene, pulled out of the fire station, and reported that roofers with tar on the roof have a fire on the roof. The fire response was upgraded to a Working Fire Response (Code 4) by 12:53 p.m. Firefighters used a ground ladder and brought a hose line to the roof and extinguished the fire. The fire was declared out by 1:10 p.m.
Fortunately firefighters were in quarters at their fire station and began fighting the fire within a minute of notification. If they weren’t in quarters, there could have been significant damage. The Illinois State Fire Marshal responded for an independent investigation. Firefighters with a ground ladder that was raised on the south side wall of Rolling Meadows Fire Station 16.